the text put forth several arguments demonstrating how the stock markets were overvalued at the time. The stock market collapse of 2000 happened the exact month of the book’s publication. some economists … challenge the predictive power of Shiller’s publication. Eugene Fama, the Robert R. McCormick Distinguished Service Professor of Finance at The University of Chicago and co-recipient with Shiller of the 2013 Nobel Prize in Economics, has written that Shiller “has been consistently pessimistic about prices,”[ so given a long enough horizon, Shiller is bound to be able to claim that he has foreseen any given crisis. a valuation measure usually applied to the US S&P 500 equity market. It is defined as price divided by the average of ten [previous] years of earnings … , adjusted for inflation. As such, it is principally used to assess likely future returns from equities over timescales of 10 to 20 years, with higher than average CAPE values implying lower than average long-term annual average returns. 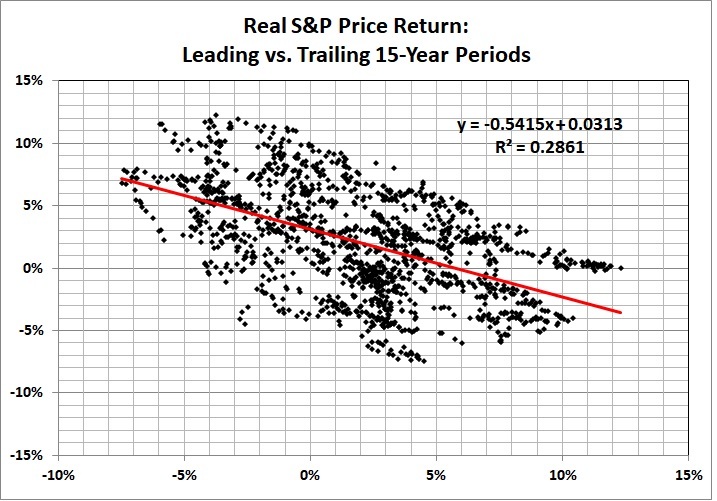 For example, the annualized real rate of price growth for the S&P Composite Index from October 2003 to October 2018 was 4.6 percent. The value of CAPE-10 in October 2003 was 25.68. According to the equation in the graph (which includes the period from October 2003 through October 2018), the real rate of price growth should have been -0.6 percent. The actual rate is at the upper end of the wide range of uncertainty around the estimate. The equation in this graph produces a slightly better but still terrible estimate: price growth of -0.2 percent over the 15 years ending in October 2018. If you put stock (pun intended) in the kinds of relationships depicted above, you should expect real growth in the S&P Composite Index to be zero for the next 15 years — plus or minus about 6 percentage points. It’s the plus or minus that matters — a lot — and the equations don’t help you one bit. As the Danish proverb says, it is difficult to make predictions, especially about the future. We all make either implicit or explicit forecasts about the markets. If we later notice market movements that seem to align with our initial forecasts we tend the pat ourselves on the back and assume the forecasts were correct. This is just one of many cognitive biases that we human beings are prone to. My suggestion is to pay no attention to bubble forecasts. They are useless. Indeed the entire bubble concept is useless. Shiller’s model relies heavily on an indicator that he devised: CAPE-10 (10-year cyclically adjusted price-earnings ratio). A current graph and the underlying data can be found here. Of the trends shown in the graph, only the trend through 1901 and the trends through 1999 and the present have been positive. The current trend (heavy black line) is the longest. Does that make it “normal”? Well, “normal” will shift up and down as the series extends into the future. Many other trends can be concocted; for example 1901-1920 (negative); 1920-1929 (positive); 1929-1932 (negative); 1932-1937 (positive); 1937-1942 (negative); 1942-1966 (positive); 1966-1982 (negative); 1982-1999-positive; and 1999-March 2014 (negative). Take your pick, or concoct your own. When it comes to stock prices, a trend is a useless concept. It’s manufactured from hindsight, and has no predictive value. What about the relationship between CAPE-10 and price growth in subsequent years? Shiller made much of this in his non-prediction of 1996. 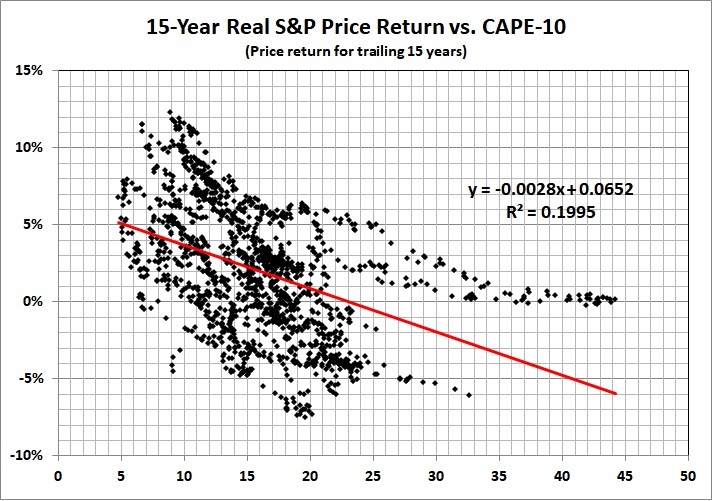 (See his “Valuation Ratios and the Long-Run Stock Market Outlook.”) There is, as you might expect, a generally negative relationship between CAPE-10 and subsequent stock-price returns. But the relationship for 1871-2014 (shown above) is so loose as to be useless as a predictor. One might, as Shiller did, select a subset of the data and focus on the relationship for that subset, which is almost certain to be tighter than the relationship for the entire data set. But which subset should one choose? The correct answer — if there is one — becomes obvious only in hindsight. And by the time hindsight comes into play, the relationship will no longer hold. I said it more than 30 years ago, and I stand by it: Trends were made to broken. And we never know when they will break. As of June 2014, the green line had increased 12,750-fold; the blue line, only 23-fold. “Buy and hold” should be: Buy, reinvest dividends, and hold.